If you are a new student in the School of the Arts, Media, Performance and Design interested in learning about opportunities for you, or have general questions, RSVP here! Winters College is the community at York that includes all undergraduate students in the School of the Arts, Media, Performance & Design (AMPD) and in Educational Studies. Winters College hosts workshops, concerts, exhibitions, lectures, and performances that provide cultural, artistic, and intellectual stimulus outside the classroom. All of us in the Winters College Office are eager to help you feel at home, and to ease your transition into university life! 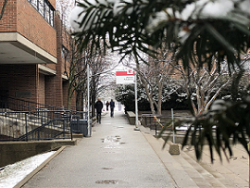 Be sure to visit winters.yorku.ca regularly to see what events are coming up next! Also, don’t forget to stop by the office to say Hi! York is a large and diverse university, consisting of more than 60,000 students, faculty and staff. The Colleges are designed to create smaller communities within the university, providing a friendly and inviting atmosphere to students. Who is a Winters student? What Student Organizations can I find at Winters?